NEW BRITAIN - Matt Lance thought his team came out a little slow on the defensive end in the first half. The final 16 minutes were much different. 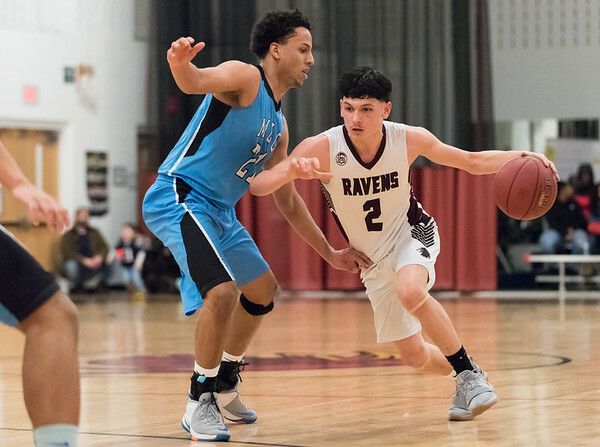 The Innovation boys basketball team held Parish Hill to a combined 14 points over the final two quarters as the Ravens cruised to an easy 75-34 win at home Monday night, qualifying for the win in the process. And there was plenty of offense, including a 28-point fourth quarter for the victors. Carlos Gonzalez led the Ravens (8-1) with a game-high 19 points, while Lenny Okonya scored 14. The pair was two of nine players to finish with a basket for Innovation. Parish Hill, meanwhile, was led by Zach Mihok, who finished with 10 points. Parish Hill: Nick Meister 2-2-7, Bert Augmen 2-0-4, Noah Sweat 0-2-2, Zach Mihok 4-1-10, Cyrus Sprague 3-0-6, Kyler Zaimoff 1-1-3, Cam Zaimoff 0-2-2. Totals: 12-8-34. Innovation: Armoni Alonso 2-0-5, Carlos Gonzalez 6-2-19, Lester Emmanuel 3-1-7, Mikey Blackman 1-0-2, LJ Hazelwood 3-2-8, Lenny Okonya 6-0-14, Gabe Matias 3-0-7, Remiesh Bogle 2-2-7, CJ Allen 3-0-6. Totals: 29-7-75. Records: Innovation 8-1, Parish Hill 4-5. Posted in New Britain Herald, Innovation on Monday, 14 January 2019 21:22. Updated: Monday, 14 January 2019 21:25.